These days, Americans do not seem to agree on much of anything. Some of it is today's politics: "Deep state" or dedicated civil servants? “Witch hunt" or legitimate investigation into crimes? "Fake news" or free press? "Alternative facts" or facts? Accomplished adversary or "lock her up?" And some of it goes beyond politics into the realms of scientific inquiry and American values. Climate change or "climate hoax?" Refugees seeking sanctuary or "caravan of foreign invaders?" Does this matter? We think it does. It's hard for our leaders to guide us when we don't agree on our values or even on how we decide what is true. Worse, our enemies, including but not limited to Russia's autocratic government, are using social media and internet postings to confuse us and divide us further. They know which hot buttons to push. Moreover, our willful disbelief of facts, truth, and science increases the chance that we will fail to recognize or take seriously growing threats. In 1993, Senator Daniel Patrick Moynihan, who famously said that "everyone is entitled to his own opinion, but not to his own facts," observed that America was "defining deviancy down." His point was that behavior that had once been seen as deviant was now considered acceptable. To paraphrase Moynihan, today we may instead be defining reality down. John here again. George Soros this week said that we are in a cold war with China that threatens to turn into a hot war. While Soros and I agree on little politically, I did find my head nodding at times in his latest CNBC interview. 1. Potential rule change: US national security may be more important than risk asset performance for the 1st time in 35+ years (but risk assets don’t seem to realize this yet). 2. If we are moving back to a “Cold War” world where US policy is driven more by the national security establishment than the Wall Street/Treasury establishment (as has been the case for the past 30+ years), then it would seem the odds are good that the chart on the front page of the attached pdf would mean revert, implying as much as a 30–60% drop in corporate profits as a % of GDP just to return to the levels that prevailed during the last Cold War, before cheap Chinese labor & (at least temporarily disappearing) Fed largesse elevated US corporate profitability to all-time high %s of GDP. 3. If a new Cold War is indeed breaking out, it would in turn seem to have severe implications for the global & US corporate debt & equity markets—it is HIGHLY unlikely that any of this money was borrowed assuming a 30–60% drop in US corporate profits as a % of GDP was even remotely possible, & on many metrics (IG, HY, leveraged loans, US equities v. ROW), valuations are quite stretched already. There are record levels of leverage in the US corporate debt market, & the rules appear to be changing for national security reasons in a manner quite unfriendly to corporate margins! NO PLAN BY any modern British government has been so soundly thrashed as the Brexit deal thrown out by Parliament on January 15th. The withdrawal agreement, the centrepiece of Theresa May’s premiership, which she has spent nearly two years hammering out with the European Union, was rejected after five days’ debate by 432 votes to 202. Her own Conservative bankbenchers voted against her by three to one. 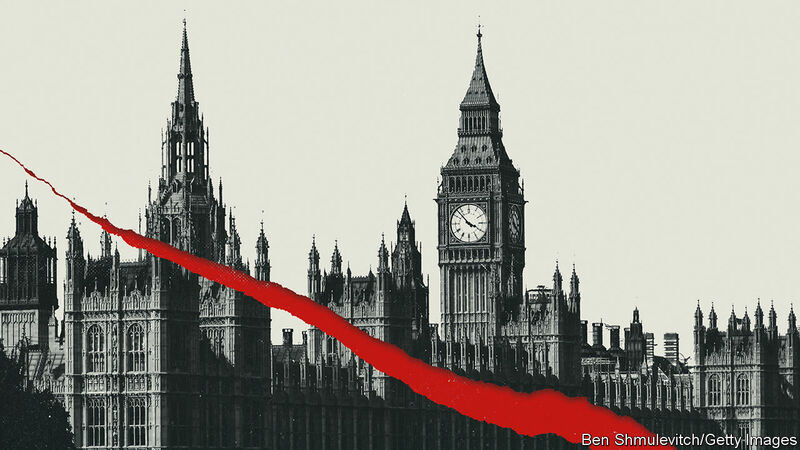 The mother of parliaments is suffering the mother of all constitutional crises (see article). Three years ago, in the biggest poll in the country’s history, Britons voted in a referendum to leave the EU. Yet Parliament, freshly elected a year later by those same voters, has judged the terms of exit unacceptable. The EU shows little willingness to renegotiate. The prime minister ploughs obdurately on. And if this puzzle cannot be solved by March 29th, Britain will fall out with no deal at all. But the crisis is not just about poor leadership. Brexit has exposed two deeper problems. One concerns the difficulties that will face any country that tries to “take back control”, as the Leave campaign put it, in a globalised, interconnected world. If you take back the right to set your own rules and standards, it will by definition become harder to do business with countries that use different ones. If you want to trade, you will probably end up following the rules of a more powerful partner—which for Britain means the EU or America—only without a say in setting them. Brexit thus amounts to taking back control in a literal sense, but losing control in a meaningful one. Leavers are right that the EU is an increasingly unappealing place, with its Italian populists, French gilets jaunes, stuttering German economy (see article) and doddery, claret-swilling uber-bureaucrats in Brussels. But they could not be more wrong in their judgment that the EU’s ominous direction of travel makes it wise for Britain to abandon its seat there. The prime minister has piled moral pressure on MPs to back the deal anyway, arguing that even if they don’t much like it, it is what their constituents voted for. It is not so simple. Mrs May’s deal is not as bad as some of her critics make out, but it is far from what was promised in 2016. Ejection from the single market, the decline of industries ranging from finance to carmaking, the destabilisation of Northern Ireland and an exit bill of some $50bn: none of this was advertised in the campaign. Voters may be entirely happy with this outcome (opinion polls suggest otherwise). But there is nothing to say that the vote to leave must entail support for Mrs May’s particular version of leaving. That is why all sides can claim to represent the “real” will of the people. For MPs to back a deal that they judge harmful out of respect for an earlier referendum which issued a vague instruction would be neither representative democracy nor direct democracy—it would be one doing a bad impression of the other. That is why the path to any deal, whether Mrs May’s or a revamped one, must involve the voters. The give and take that Brexit requires mean that no form of exit will resemble the prospectus the public were recklessly sold in 2016. It may be that voters will accept one of these trade-offs; it may be they will not. But the will of the people is too important to be merely guessed at by squabbling MPs. Parliament’s inability to define and agree on what the rest of the country really wants makes it clearer than ever that the only practical and principled way out of the mess is to go back to the people, and ask. 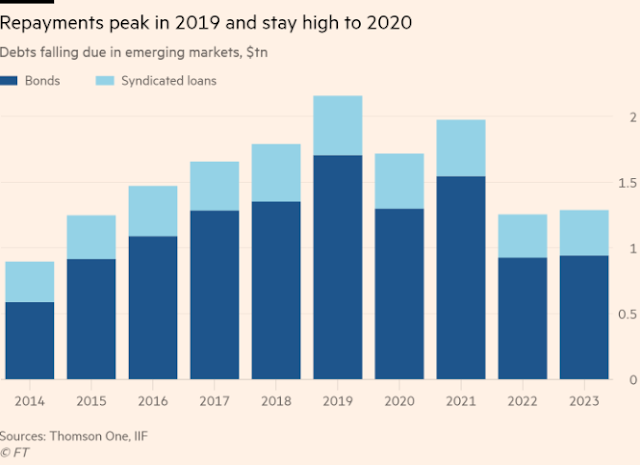 Emerging-market companies have gorged on debt. Slower global growth and higher funding costs will make servicing that debt harder, just as the amount coming due this year reaches a record high. The result? Less investment for growth and yet more borrowing. These are some of the concerns raised by the Institute of International Finance, a Washington-based industry body and data gatherer, as it published its quarterly Global Debt Monitor this week. The IIF’s data show total global debt — owed by households, governments, non-financial corporates and the financial sector — at $244tn, or 318 per cent of gross domestic product at the end of September, down from a peak of 320 per cent two years earlier. In some areas, though, borrowing is rising. Of particular concern is the non-financial corporate sector in emerging markets (EMs), where debts are equal to 93.6 per cent of GDP. That is more than among the same group in developed markets, at 91.1 per cent of GDP. 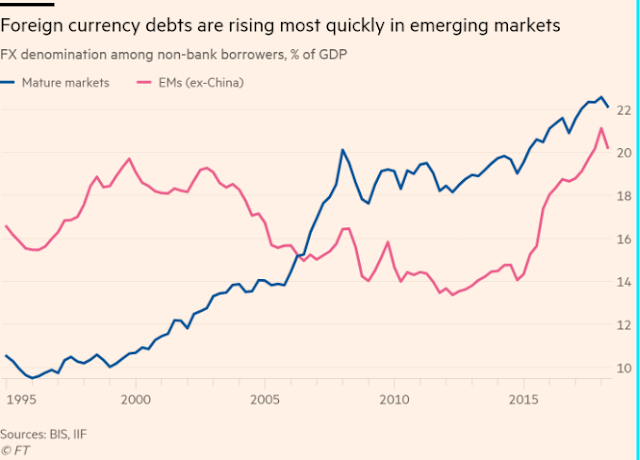 The amount of debt denominated in foreign currencies among all non-bank borrowers in EMs (excluding China, which has little foreign currency debt) has risen quickly to the equivalent of more than 20 per cent of GDP, says the IIF. This problem is expected to become acute this year, as the amount of debt maturing across EMs reaches its highest level since the IIF began collecting such data in 2014. Of $2.16tn coming due this year, more than $500bn is denominated in foreign currencies. “In emerging markets, the issue is not the level of debt but the pace of accumulation,” says Emre Tiftik, an IIF economist, pointing to countries such as Saudi Arabia, South Africa and Turkey. Jim Barrineau, head of EM debt at Schroders, says Turkey offers a great example of a corporate sector with foreign currency debts that must be repaid out of local currency revenues. This is an age-old problem, described as “original sin” by economists Barry Eichengreen and Ricardo Hausmann after the EM debt crises of the 1990s. Many governments made great efforts to reduce their vulnerabilities over the following two decades — at least until recently. In the end, each country has just the one balance sheet. Meeting those obligations may be about to get tougher. •The six largest financial institutions in the United States earned a return on shareholder's equity of 10 percent or more in 2018, the first time since before the Great Recession. •Even with the reduction in the size of the Fed's securities portfolio, the banking system has more than $1.6 trillion in excess reserves, plenty of liquidity. •It seems as if both the large financial institutions and the Federal Reserve are well positioned for the "uncertainties" the economy might be facing in 2019. The current economic recovery in the United States will hit its tenth anniversary this summer, but an uncertain atmosphere surrounds the world, both business-wise and politically. So, where does the Federal Reserve find itself at this time, and where is the banking system? My answer to this is that the Federal Reserve and the banking system seem to be in pretty good shape for an uncertain future. Fourth-quarter bank earnings for the largest six banks in the United States were mixed. I have written about the bank earnings in four posts during the past week. One conclusion that can be drawn from the mixed results was that there seemed to be no common theme amongst the results of the big banks. A couple of the bank sustained poor trading results, but other than that, there was no indication of a consistent pattern. And, there was no evidence that the fourth quarter was anything other than one unique quarter out of the four in 2018. For the year as a whole, we got results like Morgan Stanley (NYSE:MS) hitting historic high earnings. Furthermore, for the first time in almost fifteen years, all six of the largest financial institutions in the United States earned a return on shareholder’s equity around 10.0 percent or above. This was truly unique and, for me, a good sign. It pointed to the fact that these banks were succeeding in transforming themselves to function successfully in the 2020s. This includes Goldman Sachs (NYSE:GS), the last of the “big six” to restructure its organization after the Great Recession, and Bank of America (NYSE:BAC), whose CEO Brian Moynihan has taken a very, very slow pace to reach a double-digit ROE in its turnaround. The managements of these institutions, however, are not rushing out to exhibit their new strength. In fact, two of the largest banks have explicitly started to structure themselves for the uncertainty that lies ahead. Both JPMorgan Chase (NYSE:JPM) and Citigroup (NYSE:C) explicitly stated that they had taken steps to prepare themselves for the uncertainty that everyone was facing with regards to what might happen in 2019. The banks seem to be very comfortable about their reserves for loan losses and each institution has a lot of cash on hand. Thus, it seems that banks with over fifty percent of the assets in the US banking system are producing good returns, are taking a very conservative attitude with respect to running their banks, and are being very cautious about the future. This is totally unlike the situation in Europe where the central bank admits to the fact that several countries within the community, and especially Italy, have banks with large amounts of loans and securities that need to be written down. It is incredible to hear this at a time when the European Central Bank is just beginning to move from its stance of quantitative easing. What about the Federal Reserve’s position? I believe that the Federal Reserve has managed itself very well, given the position it is in. For example, the Fed’s line item, Reserve Balances with Federal Reserve Banks, a proxy for excess reserves in the banking system, totaled $1,625.5 billion on January 16, 2019. Thus, there is plenty of liquidity in the banking system, itself. In fact, all the cash in the large banks take up a goodly share of these excess reserves. The decline in the Fed’s securities portfolio has resulted in a decline in these "excess reserves," which stood at 2,2343.5 billion on January 17, 2018. The reduction in the securities portfolio of the Federal Reserve has been smooth and steady and has resulted in a decline in “excess reserves” without any disruptions to the banking system. But, this is always what the Fed wanted to achieve as it has explicitly intended to err on the side of monetary ease as it conducted policy following the Great Recession. And, the Fed has been very successful in achieving this goal. Furthermore, there seems to be very little pressure on the Fed’s policy interest rate range. For the last several weeks, the effective Federal Funds rate has remained at 2.40 percent, 10 basis points under the upper limit of the latest range for the Federal Funds rate and there appears to be no market pressure at all for this effective rate to rise. Federal Reserve officials have indicated that they would like the range for the policy rate to be at least 50 basis points higher, but for now have argued that any further increases in the range will be very data dependent and will not take place on a signaled schedule as the past few increases have been. Concern over future economic growth and the volatility of the financial markets, especially stock market volatility, have caused the Fed officials to back off from a more aggressive stance. Bottom line, I think that the Federal Reserve and the banking system are positioned well right now, given what they have come through and the uncertain future they are facing. Certainly, more needs to be done. I am comfortable with the Fed’s position right now and with the view that they need to move in the future with much discretion. Here, Fed officials must go with the “feel of the market” and must move carefully to meet the market’s needs. I don’t think the Fed should be a “leader” of markets right now. The Fed still needs to further reduce the size of its securities portfolio and there seems to be adequate liquidity within the banking system to absorb further reductions. Still, Fed officials must not be rigid in how they continue to pursue this exercise. Given the uncertain future, the Fed still needs to err on the side of monetary ease so as to avoid disruptions to the banking system. And the largest banks? May they continue to earn a return on shareholder’s equity of 10 percent or more and may they continue to function to the conservative side of the management practice. After his inauguration on Jan. 10 to a second term as Venezuela’s president, Nicolas Maduro faced backlash from several world leaders who saw his re-election as fraudulent and his presidency as illegitimate. But one leader who refused to condemn Maduro is Mexican President Andres Manuel Lopez Obrador, who was himself inaugurated only on Dec. 1. 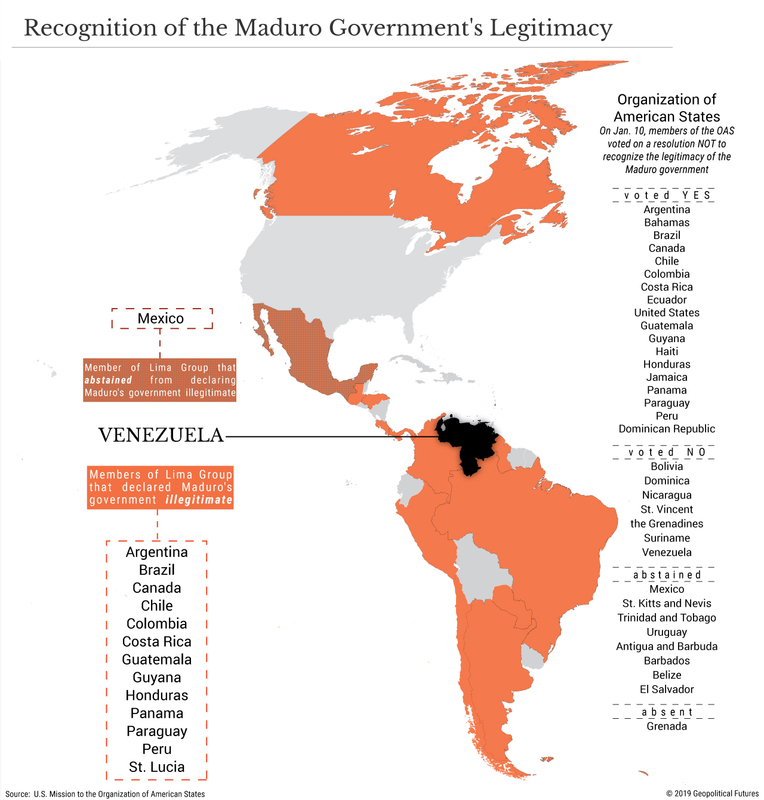 Other Latin American nations have criticized Lopez Obrador for refusing to label Maduro’s government as illegitimate. Many saw the move as a sign that, under Lopez Obrador, Mexico might adopt a more populist, left-oriented foreign policy. But this isn’t the case. Though it’s true that the new president’s foreign policy will be different than his predecessor’s, it actually mirrors an approach that Mexico followed for decades. For 70 years, until Vicente Fox took office in 2000, Mexico’s foreign policy had been guided by the Estrada Doctrine. Named for Genaro Estrada, who served as the Mexican foreign affairs secretary from 1930 to 1932, the doctrine took a noninterventionist approach to diplomatic relations, promoting the idea that countries shouldn’t interfere in the domestic affairs of other nations and that they especially shouldn’t comment on the legitimacy of foreign governments. From this perspective, anything short of minor signals of disapproval – such as recalling diplomatic staff or limiting diplomatic presence in a foreign capital – is viewed as unacceptable. It’s not hard to see why Mexico adopted such an approach. Throughout its history, Mexican governments have had to deal with foreign invasions and regimes that refused to acknowledge their legitimacy and Mexico’s autonomy. Since the 19th century, Mexico fought Spain for its independence, was invaded by France and was partially annexed by the United States. But the country’s problems weren’t brought on only by external factors. After gaining independence, it descended into civil war, and in the early 20th century, numerous revolutions threatened to destabilize the country. Foreign powers often took sides in these fights. Mexico, therefore, has repeatedly felt the frustration of being subjugated by foreign governments and struggling to gain international recognition. This history was the foundation of the Estrada Doctrine. But as Mexico developed into an emerging economy, it began experimenting with other foreign policy approaches to reflect its new status. In 2000, when the National Action Party unseated the Institutional Revolutionary Party, which had been in power since 1929, the administration of Vicente Fox aspired to increase Mexico’s influence in multilateral organizations and strengthen its ties with the U.S. Fox believed cooperating with Washington would help boost Mexico’s international profile, as one of the United States’ top and most trusted partners. This approach continued with the administrations of Felipe Calderone in 2006-12 and Enrique Pena Nieto in 2012-18. But it had some major drawbacks and ultimately proved detrimental to Mexico’s broader objective of increasing its role in the region. As part of its closer alignment with the U.S., Mexico began to take positions on issues that were inconsistent with its historical orientation. It criticized the governments of Cuba, Venezuela and Honduras (among others) and commented on their domestic affairs. Some began to see Mexico as a puppet of the United States, using its cultural, linguistic and historical ties to Latin America to do Washington’s bidding in the region. And in doing so, Mexico put at risk one of the biggest advantages it had in the region over the U.S. – its credibility among Latin American countries. Mexico’s international status did improve, but it came at a price. Lopez Obrador’s refusal to condemn Maduro’s government in Caracas has to be seen in this context. Mexico doesn’t want to set a precedent for foreign interference in domestic affairs, even in countries facing political crises, because it, too, has been the subject of external interventions in the past. This approach doesn’t prevent Mexico from expressing concerns about certain regimes. In the past, it has removed its diplomatic missions from countries with governments widely criticized by the international community – such as Chile under Augusto Pinochet and Spain under Francisco Franco – but it stopped short of making claims about the governments’ legitimacy. The Lopez Obrador government may consider pulling its diplomatic mission out of Venezuela at some point, but for now, it prefers to sit on the sidelines and watch how things play out. But there’s one key difference between the way the Estrada Doctrine was applied in the past and the way it’s being applied today. Lopez Obrador wants to portray Mexico as a strong and independent country able to compete with the United States for influence in North America. In his inaugural address, Foreign Minister Marcelo Ebrard laid out this vision for Mexican foreign policy to the country’s diplomatic corps. He said Mexico’s position in the world has grown stronger, and it, therefore, has a greater ability to achieve its strategic objectives. According to Ebrard, the current global climate (which refers in part to ongoing tensions over trade) will require Mexico to design new responses to old realities. Mexico “can’t rely solely on tradition” to navigate its relations in North America. Mexico’s government will, therefore, be looking to break from the past three administrations and forge its own position on issues independent of the U.S. One area in which it has already done so is the Central American migration issue. While the U.S. has sought to prevent migrants from reaching its southern border and rely on other countries to deal with the problem, Mexico has offered alternative solutions, trying to absorb some of the migrants and even hiring them to work on major infrastructure projects in the south. By adopting a softer stance on the migrants than the U.S. has, Mexico can boost its image and influence with Central American nations. Lopez Obrador has also campaigned for a mini-Marshall Plan for Central America to help spur economic development and improve the security situation there – though it’s relying on Washington to fund the project. These policies have a minor impact in the short term but may help position Mexico as a regional leader over time. The government also plans to use culture as one way to project influence. In his inauguration speech, Ebrard said his country has not forgotten about Mexicans living abroad and that they, too, are “part of the Mexican nation.” By emphasizing the cultural links, Ebrard is trying to appeal to people of Mexican heritage in the United States, particularly those in the southern border states, who have close ties to Mexico even though, in some cases, their families have been in the U.S. for generations. Mexico can use these cultural ties in the future to extend its influence into the borderland. Meanwhile, it’s also cracking down on fuel theft, which has cost state-owned energy firm Pemex $3.3 billion between January and October 2018, to reduce its dependence on U.S. energy – which will help Mexico gain more control over its own foreign policy. It might seem like a contradiction – that Mexico is embracing a noninterventionist foreign policy, seen through the president’s comments on Venezuela, while also expanding its regional influence. But the government is trying to strike a balance between learning the lessons of Mexico’s past and taking advantage of its growing regional clout to pursue its interests, thereby positioning Mexico as an alternative to the U.S. and a critical partner for other Latin American countries. So Mexico is indeed changing the direction of its foreign policy; it’s just not heading in the direction that most people think. The country’s crisis is escalating with no end in sight. Thousands in Venezuela took to the streets to protest President Nicolas Maduro yesterday. Coverage of the events has focused on the demonstrations and the responses of the opposition and foreign governments, but few have considered the long-term impact of Venezuela’s downward spiral. First, however, we need to take stock of what’s happened in the country so far. As of now, Maduro remains in power. Opposition leader Juan Guaido swore himself in as president during yesterday’s marches, and the U.S., along with at least 13 other countries, recognized him as Venezuela’s interim leader. Maduro responded by cutting diplomatic ties with the U.S. and giving its diplomats 72 hours to leave the country. Venezuela’s Supreme Court, meanwhile, issued a warrant for Guaido’s arrest. The military remained silent throughout most of the day, suggesting internal discord. Then in the early evening, the defense minister and other generals said the country’s Constitution must be protected, and they recognized Maduro as president. Some media outlets have reported that U.S. President Donald Trump’s administration is prepared to apply sanctions on state-owned oil firm Petroleos de Venezuela, or PDVSA, and to put Venezuela on the state sponsors of terrorism list. Some even speculated that military action may be possible. Guaido has announced plans for another march in February to demand more humanitarian aid to the country, suggesting the opposition plans to continue campaigning for Maduro’s ouster even after the opposition leader declared himself president. Whether the response from foreign governments registers with the Venezuelan administration depends on how they convey that they no longer recognize Maduro as president. Without follow-up actions, Washington’s moves may not mean much, though it could apply more pressure by leaving U.S. diplomats in Caracas, in defiance of Maduro’s orders. The talk of imposing sanctions or adding Venezuela to the terrorist list shows that Washington doesn’t really see Guaido as the country’s leader, or else it wouldn’t need to make such threats. The opposition, after all, will have limited power so long as the military refuses to join its cause, and it has yet to demonstrate that it can carry out government functions. 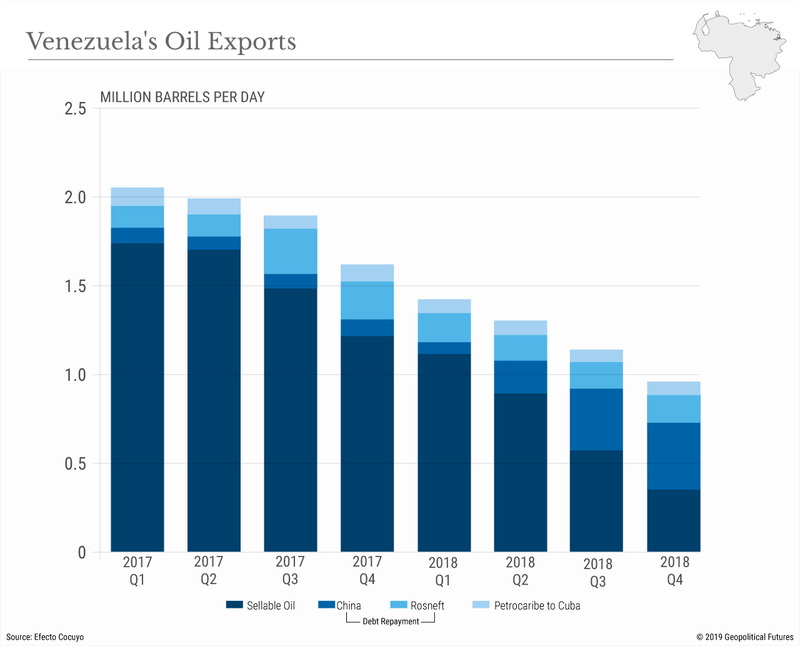 As for the impact on the oil industry, short-term fluctuations in price and supply are possible, but oil markets and producers have learned to expect volatility from Venezuela after years of crisis. Oil exports from the country have dropped by half over the past two years, to just under 1 million barrels per day. More important, Venezuela has already promised much of the oil it produces to countries such as China and Russia to help pay down its staggering debt. The latest upheaval, then, won’t have much effect on the global oil market. If the U.S. decides to follow through with sanctions on PDVSA, it will feel the move more keenly than any other country – besides Venezuela, of course. The U.S. is by far the largest importer of Venezuelan crude oil, and cutting off those imports would force it to tap into its own reserves or use alternative suppliers. The potential repercussions for U.S. refineries and businesses are among the top reasons Washington hasn’t followed through on this threat so far. Though its energy industry has been suffering for a while now, Venezuela is still home to the world’s largest oil reserves. Oil companies want to be involved there not for the profits they can earn now but for the profits they can earn in the future. Maduro can’t hold on to power forever. When his government collapses, there will be a push to revive the industry and many firms will be ready to help. That’s why even U.S.-based oil companies, such as Chevron, have stayed in Venezuela despite the deteriorating conditions and international condemnation of Maduro’s government. Russia and China have also chosen to take the long view. Russia fulfilled most of its arms contracts with Venezuela before the most recent instability broke out and has said it won’t pursue further defense cooperation for now. Its main concern is how the unrest might affect its joint projects with Venezuelan oil companies. Moscow is hedging its bets in Venezuela, holding on to its assets and operations there while it waits to see how things play out. Similarly, China, a major importer of Venezuelan oil, is biding its time. No matter how the current turmoil in the country ends, Venezuela’s problems won’t disappear overnight. Venezuela’s economy needs complete restructuring, its infrastructure needs an overhaul, and its people need access to basic necessities. What’s more, the fallout of mass migration spurred by the failing economy will be felt for years to come. Even if the government and opposition reach a deal, those who have left the country are unlikely to come back anytime soon. The changes that might bring them back will take a lot of time and resources that Venezuela doesn’t have right now, and the loss of so many people may well hurt its economy in the long run. In the end, Venezuela’s problems will outlast its current political drama.